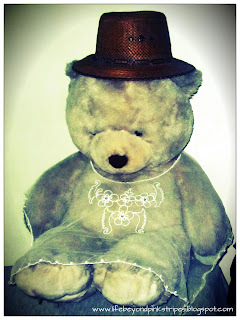 It's so amusing that somebody from our family decided to dress up our Big Bear in the house. :) And it isn't just any piece of clothing but a sheer top which is actually a traditional Filipino attire called KIMONA. Kimona (not to be confused with Kimono from Japan ^^) is a blouse, ranging from sheer to translucent, with embroidery and extended sleeves that is worn over an inner garment such as sando. There are variations to this but that on the Big Bear is one of the simplest designs I have seen. It is usually partnered with a skirt called PATADYONG. Unfortunately, our Big Bear's "bottomless" hahaha. Anyway, according to my research, such skirt originated 150 years ago in Antique and usually checkered in design. To complete the wardrobe, sometimes a folded rectangular cloth of the same fabric as the skirt is placed on top of one shoulder. And a scarf (usually of the same fabric as the skirt as well) is tied on the head. in the most traditional form. In the past, the Kimona and Patadyong tandem was considered fashionable especially in the barrios. 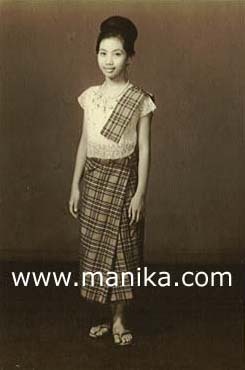 It was very practical to wear too since Philipines was (still is and forever will be) a tropical country, so the lightweight fabric and structure kept the ladies then modestly dressed but somehow feeling fresh. If you were to reinvent Kimona and Patadyong in such a way that it would be wearable today even for normal days, how would you do it?